Take your seat and get ready for an extraordinary journey between land and sea! All aboard for a fabulous trip! 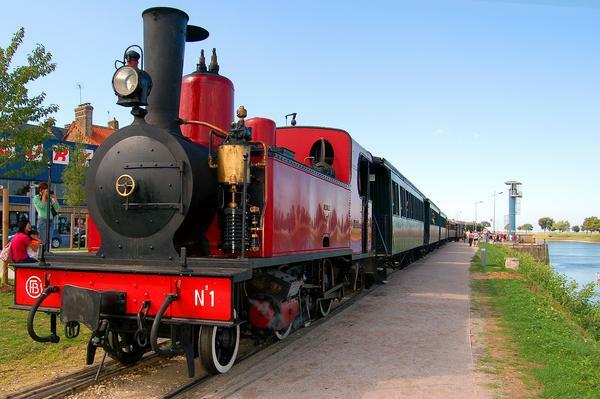 You’ll follow the Bay of Somme along the path of the old railway, built in 1887. Share this exceptional adventure with your children so they can discover the beauty of the countryside, and travel with them back to the past, to the nineteenth century and the amazing steam locomotives of the era. On board, the setting is idyllic! You’ll think you’ve entered a time machine! Inside, everything is vintage. The steady pace of the locomotive will cradle you throughout your journey. You’ll explore wide-open spaces, swamps, woods and the Bay and its ports: all the characteristic landscapes of this beautiful region. And there’s an extra! Dinner trips are organized every Saturday! It’s a great idea for an unforgettably romantic dinner surrounded by charming period furnishings and a fabulous landscape! And you can reserve a bottle of Champagne on the website! You can come throughout the year to discover this attraction by reservation. A website lists the schedules and allows you to buy your ticket directly online. It also provides more information on the railway line and its history.